Two years ago, immigrant leaders from across the country camped out on the National Mall in the Fast for Families to inspire a hunger strike, witnessed and supported by me and other Gamaliel faith leaders from Baptist, Lutheran, Catholic, Jewish and other traditions. Last fall, our leaders headed to Nevada to hear President Obama announce executive action for immigration reform and extension of deferred action for our Dreamer young people (sadly still on hold due to pending lawsuit). This past week, leaders made a pilgrimage to Washington, D.C. and Philadelphia for the visit of Pope Francis to the U.S., which millions have rightly seen as an opportunity to speak up for economic and social justice. 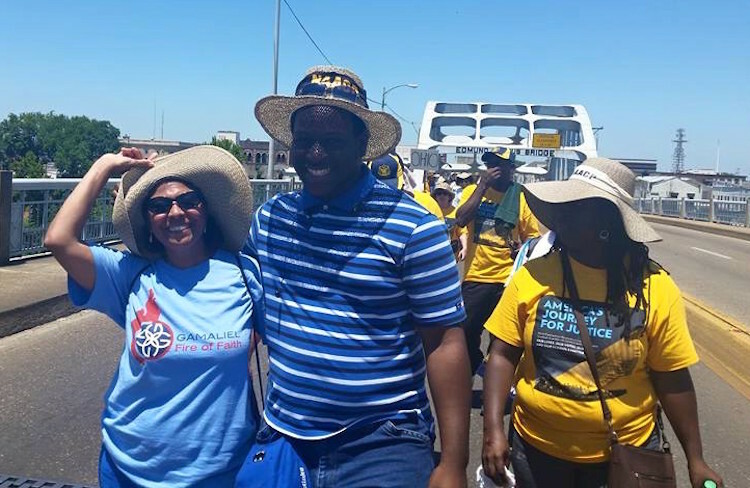 Our movements can shift quickly from one issue or action to another, which is why I don’t want to lose the moment to congratulate the NAACP on the conclusion last week of their Journey for Justice march from Selma to Washington, D.C. to celebrate and reinforce the Voting Rights Act on its 50th anniversary. I was there for some of the march, and proud to advocate for the Voting Rights Advancement Act of 2015. Amazing. That’s really the only word that encompasses how I’m feeling after this week’s RestoreTheVRA rally on Congress’s lawn. . . . It’s essential that we bridge the divide between our issues and, more importantly, take back our democracy from the corporate influence that’s holding back all kinds of progressive activists. Say it sister! Whether it is seeking to deport people whose massive contributions help make the United States rich, or keeping people of color from getting to the polls, structural racism is the common theme that runs through our work. As an organizer I know it wasn’t easy to pull off a 1,000-mile march. And it was tragic that one of the marchers, Middle Passage, from Pueblo, CO, passed away of a heart attack en route. With all of its highs and lows, the march was an uplifting reminder that the work that led to the first Voting Rights Act is not yet done, and it’s our job to keep marching onward. Connecting our movements and working together, we will make these times more than interesting; we will make them times of change. And we can carry on the work to end structural racism together—whether we are working on immigration reform or voting rights, the environment or employment. Because in the end, they are all connected, and we deserve a spot at the table debating the issues that affect us, no matter what they are.